Known for the landmark band shell on its shoreline, Lake Harriet is one of the largest lakes in the Chain of Lakes. With many ways to enjoy the lake including sailing, paddling, fishing and swimming, it is a favorite summer destination for visitors. The nearby rose and rock gardens, bird sanctuary, and historic streetcar are additional attractions for those who come for concerts and special events at the band shell each summer. Lake Harriet has excellent rankings in all aspects of the Index with its beautiful aesthetics, available habitat, high water clarity, consistently low bacterial levels, and variety of ways for visitors to enjoy the lake. To measure water transparency with a Secchi disk, the disk is lowered from the shaded side of a boat until it cannot be seen. The depth of the water is recorded at the point where the disk reappears upon raising it from its original depth beyond visibility. 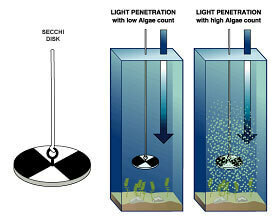 It is important to remember that the Secchi measurement is a simple, approximate measurement of water clarity and can be influenced by various factors such as time of day, reader’s eyesight, water color and suspended particles in the water. Therefore, Secchi disk readings should be used as a comparative tool to determine trends between lakes and over time. Increased water clarity may be due to reduced nutrient inputs, seasonal algal cycles, decreased sediment inputs, and zooplankton grazing on algae. Decreased water clarity may be due to large algal blooms, increased soil erosion inputs, wind circulation of sediments and nutrients, stormwater inputs, or a decrease in zooplankton. Secchi readings for the lakes are done during the regular lake sampling schedule, with some lakes sampled every other year. Each summer, thousands visit our City lakes and enjoy a refreshing swim at our many swimming beaches. To ensure a healthy and enjoyable experience for these swimmers, we monitor the water at the public beaches for E. coli, bacteria that can be an indication of health risks for swimmers. Beaches close if a water sample does not meet the State of Minnesota’s guidelines. A beach reopens when testing reveals that levels are within guidelines. The test for E. coli takes 24 hours, and results are posted early afternoon the day after we sample a beach. The closing of a Minneapolis beach is rare, and in most cases the beach will re-open quickly. Pick up after your Pet: Increased bacteria levels predominantly come from waterfowl and pet wastes in yards, streets and parks that wash into lakes either directly or through the storm sewers as the result of a heavy rain. Avoid Swimming after a Rainfall: Elevated bacterial levels in lakes generally return to normal levels within 48 hours of a rainfall. Swim Healthy: Avoid swimming if you or your child have diarrhea, to prevent the transmission of the disease. Keep it Clean: Be careful to not get lake water in your mouth. Wash your hands before eating and after changing a diaper. Shower afterwards if possible. To avoid becoming infected, towel dry immediately after exiting the water and shower afterwards, when possible. Characterized by small, irritating red welts that appear after swimming. Sensitive individuals may itch for several weeks. Occurs most often after swimming on hot, still summer days. Caused by a parasite that infects birds and snails during different stages of its life. The parasite is unable to live in humans.